The Real Ghostbusters (above) will now get a sibling as a new Ghostbusters animated show has been announced. The new Ghostbusters film opening next month isn’t just a single movie. It’s potentially the start of a whole new era for the franchise. And we now know the next project in that world, as Sony has announced a brand new animated Ghostbusters TV show to begin airing in 2018. That write up is a bit confusing. We get that this show will take place in the future with a new team of Ghostbusters. But saying it’ll “further expand the Ghostbusters cinematic universe” is odd. Because this isn’t a “cinematic” show. It’s a TV show. What it suggests is that this show will simply be in the same canon as the Paul Feig film. That’s pretty much why Ivan Reitman’s Ghost Corps production company exists now anyway: to create a unified series of projects in all mediums for the Ghostbusters. 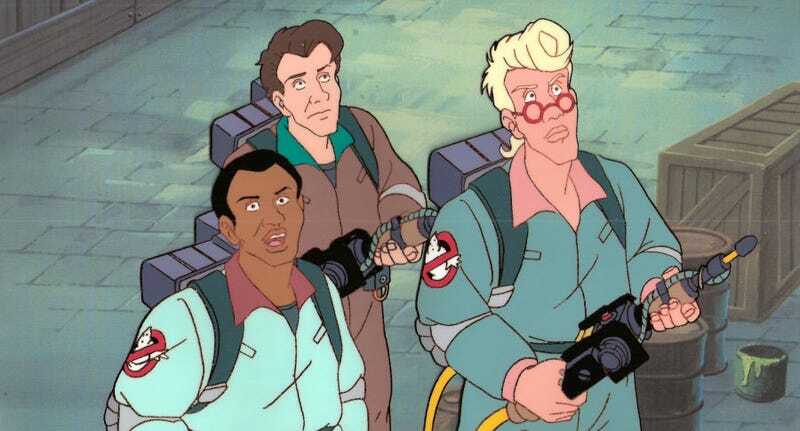 And, of course, this isn’t the first time Ghostbusters was an animated series. The Real Ghostbusters aired in the late 1980s after the release of Ghostbusters 2.